Cinnamon is known as the king of spices for the rich aroma it gives off. In addition to being a well-known spice, it has medicinal uses as well. 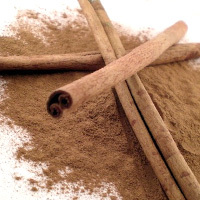 Many natural remedies make use of cinnamon bark. It has an antibacterial effect on the body, which can prevent bacterial infection strengthening you immune system. Although cinnamon isn't considered one of those foods you need to watch out for, when taking supplements containing cinnamon, be advised to moderate your dietary intake of cinnamon to prevent it from damaging your liver. The calories in Cinnamon per 2g(1tsp ) is 7 calories. Cinnamon is calculated to be 364Cal per 100 grams making 80Cal equivalent to 21.98g with 1.59g of mostly carbohydrates、0.07g of protein、0.07g of fat in 2g while being rich in vitamins and minerals such as Manganese and Calcium.